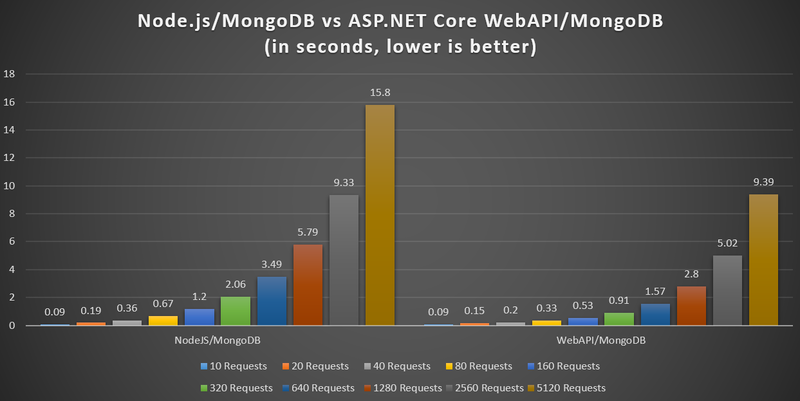 Tonight's posting is shifting a bit from my original plan of using JSON Storage in favor of testing MongoDB with ASP.NET Core and comparing it to SQL Server/ASP.NET Core and Node.js/MongoDB. At this point I am going to assume MongoDB is up and running, if you do not, check my first day post for details on how to get it up and running. For this deep dive, the only new element I needed to add were the NuGet package reference for the MongoDB.Driver. Because I am using ASP.NET Core instead of 4.6.2 I needed to download 2.3.0-rc1. Regardless, the package also installs MongoDB.Bson and MongoDB.Driver.Core NuGet packages as well. Not truly comfortable with the results, I re-ran the benchmarks several times and all were within 2% of the previous results. Interesting to say the least that .NET at least in this scenario is faster across the board than a Node.js implementation. Tomorrow I hope to see if maybe there are some Node.js optimizations I can apply admitting that before Tuesday night I had never messed with Node.js before.